I am trying to upgrade my MacBook (7,1) from Snow Leopard (10.6.8) to El Capitan. 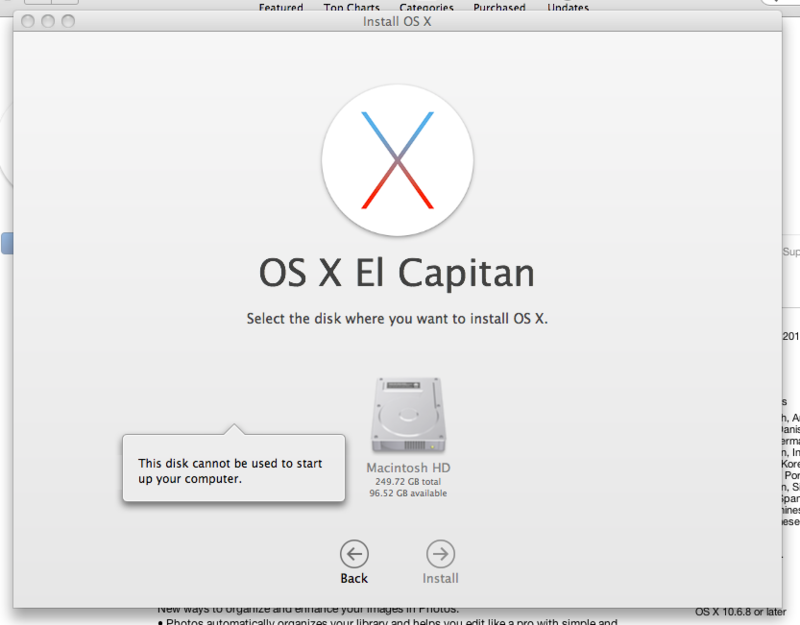 I have obtained the El Capitan installer from the App Store, but when I run it I am unable to select my disk to install. The icon for my disk is "greyed out", and when I attempt to click it a message appears saying, "This disk cannot be used to start up your computer." Using the Disk Utility, I have verified both the disk permissions and the disk itself. I have also tried deleting and re-downloading the installer from the App Store. I don't know what else to do. I do have a Time Machine backup on an external drive, but I do not have the Snow Leopard installation disk. I'm at a loss. Browse other questions tagged el-capitan snow-leopard upgrade . Is it still possible to purchase a license for Mac OS X 10.6 Snow Leopard Server from Apple?